Another little cookery class at the Club, to celebrate mid Summer. Back to the French Caribbean with gusto – and more importantly, with Virginie. After some soul searching, we settled on pork as the original chicken in coco was deemed to be potentially problematic if the chicken scare had not subsided. Quite a few of the participants are now habitués and seem to enjoy our style of cooking, albeit in not too easy circumstances since we are not in a kitchen. However, we had the benefit of the new function room at the club, opening onto the new patio and it was glorious. We also had at our disposal a new mini cooker, which helped considerably. The flambéed bananas for the dessert went amusingly well but I forgot to get the planned vanilla ice-cream out of the freezer! Our guests were too polite to mention the fact that it did appear on the recipe but not on their plate! So, on the next menu, there will be vanilla ice cream! 1. Prepare a marinade with the lime juice, the garlic, the chillies, the chives, the ginger paste and toss the meat cubes in it. Place in the fridge for approximately 4 hours. 2. After that time, warm the olive oil in a big cooking pot ( I tend to use a pressure cooker) and add the spring onions. Toss for a few minutes, then add the meat and again, toss quickly. 3. Remove the chillies from the marinade and reserve. Add the papayas and the plantains on top as they are fairly delicate. Season with salt and pepper. 4. Pour the marinade and the coconut milk on top, cover and cook for 30 minutes in an ordinary cooking pot or 5 minutes in a pressure cooker. The lime juice marinade will have almost pre-cooked the meat. 5. Serve with créole rice and a planteur. I started this blog a year ago and it’s time that I added one of my favourite soups, usually eaten in Summer, at a table overlooking the Mediterranean, either in Provence or in Corsica. It will be difficult to source the “poissons de roche” (fish found hiding in rocks on the Mediterranean coast) but a little chat with the fishmonger will help me choose fish which will provide a tasty alternative. 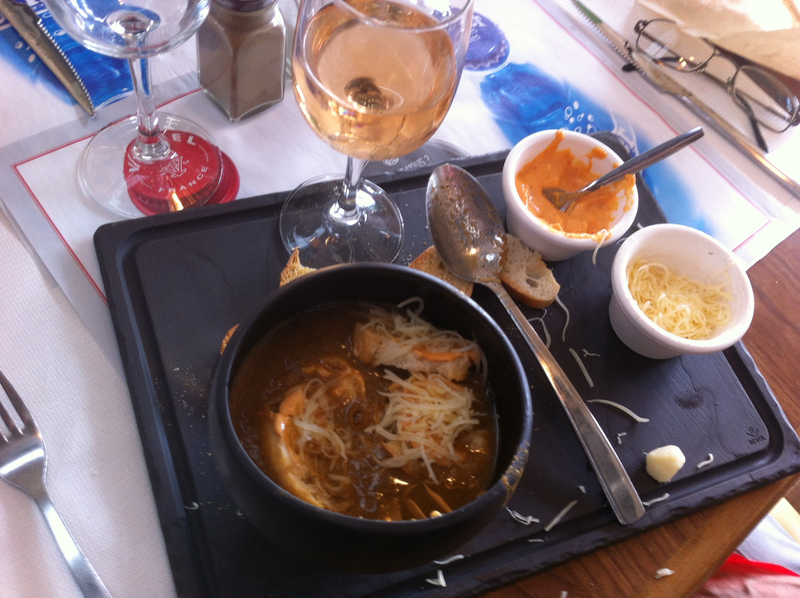 It is not a Bouillabaisse, the speciality of Marseille, but it is very popular. Croûtons, rubbed with raw garlic and covered with rouille (see recipe further) are served with this soup, also sprinkled with a generous amount of grated Emmental cheese. Although it is usually served as a starter, I like it so much I eat two small tureens of it and then just have a dessert to follow. The smell of this soup alone evokes hot Summers and holidays, so it is worth taking the time and making the effort to prepare it. If you can, make a large quantity as it freezes well. 1. Ask your fishmonger to remove the fish scales and de-gut the fish. Leave the heads on. Rinse the fish and pat dry with kitchen paper. Warm the olive oil in a big cooking pot and add the onion and garlic. When they are golden, add the tomatoes, fennel, parsley, bay leaf, saffron, salt and pepper. Lastly, add the fish. 3. Stir for 3 minutes, and simmer for another 10 minutes. Add 2 litres of boiling water, cover and simmer for 30 minutes. In a blender, put the garlic, chilli, saffron, bread, olive oil, salt and whizz. You should obtain a thick, fragrant sauce, rust coloured, hence the name rouille. 4. When the soup is cooked, use a stick blender and whizz. Filter through a very fine sieve twice. Pour it back into the big cooking pot and warm it up gently. Do not allow it to boil. 5. Serve immediately in a big tureen or individual ones with croûtons, grated Emmental cheese and whole garlic cloves.